Boris Godunov, opera: 1874 Version. Scene 1. Exalted boyars! Boris Godunov, opera: 1874 Version. Scene 1. The Tsarevich - quickly! 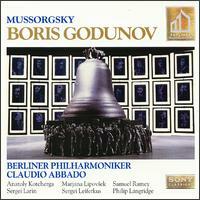 Boris Godunov, opera: 1874 Version. Scene 1. A bell! A funeral knell! Boris Godunov, opera: 1874 Version. Scene 2. Bring him over here! Boris Godunov, opera: 1874 Version. Scene 2. Hey ho! Very Good. Very Good condition. Audio CD. Case Very Good. 3 disc set. Slipcase Good. Booklet included. Booklet Like New. Quality guaranteed! In original artwork/packaging unless otherwise noted.